Standard Award destination. 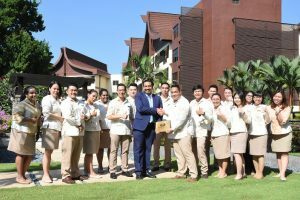 The award was presented to the resort by Dato’ Seri Mohamed Nazri Abdul Aziz, Malaysia’s minister of tourism and culture during the Annual ASEAN Tourism Forum (ATF) & Culture held in Chiang Mai, Thailand recently. 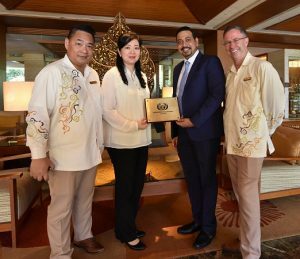 Picture shows Ashwin Gunasekeran (in blue suit) CEO of Penang Convention and Exhibition Bureau congratulating Elain Yue, General Manager of Shangri-La’s Rasa Sayang Resort & Spa. On the left is Albert Lafuente, Director of Sales and on the right is Nick Flynn, Resident Manager. essential for enhancing the quality of tourism products and services, in addition to responsible management practices among stakeholders in the region’s tourism industry. Picture shows Ashwin Gunasekeran (in blue suit) CEO of Penang Convention and Exhibition Bureau congratulating Albert Lafuente, Director of Sales & Marketing and his team. Indonesia, Lao PDR, Malaysia, Myanmar, the Philippines, Singapore, Thailand and Vietnam.